Can you measure how well crescent moon is drawn? Some other's whose tile you just saw? When we made our DVD for our Zentangle Kit, it wasn't to show you exactly how something was supposed to look. We wanted to show you an easy method, an approach to your inner door of self-expression, creativity, and fun. We wanted each and every stroke (step) to be one you'd see and say, "I can do that!" And if you can do one stroke, you can create Zentangle art, one stroke at a time. And just as we point out that there's no eraser in a Zentangle Kit, there's also no ruler. Here is a picture of the first tile we did for that DVD. Although we chose which tangles to do, we didn't have a plan of what it would look like. The entire video was done in one take. Is this the way crescent moon, or florz, or any other tangle is supposed to be done? Every time we see a new version, we find a new way it can look and we take inspiration and appreciate it. 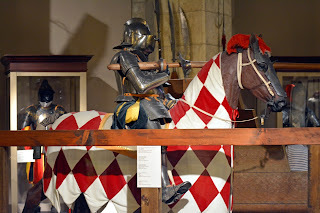 If you set out with a ruler to find something that fits your expectations, what will you do if you encounter something that exceeds your expectations? Would you even notice it? "I never set out with any preconceived notion of what sort of photos I'm going to make. I just head out and see what I see, and when the light is hot, I just might get something interesting. [...] I've found going to places already on someone else's map to be far less productive than just wandering around with open eyes. How eloquent! And how appropriate for creating Zentangle art. New worlds aren't found on old maps. As we describe in our book, having no predefined right answer is both a charm and a challenge of the Zentangle Method. There is no "right" answer to look up in the back of the puzzle book and no one (at least, we hope not!) to look at it and say, "Correct!" or, "Incorrect!" So . . . what does crescent moon look like? Better to ask yourself, "What does my crescent moon look like at this moment on this tile?" With a relaxed focus and leaving rulers and preconceived notions aside, expect to be surprised and delighted. Naturally, passion and gratitude help. I couldn't wait to show Maria. Truly an LOL moment. Hi all you passionate tanglers out there! 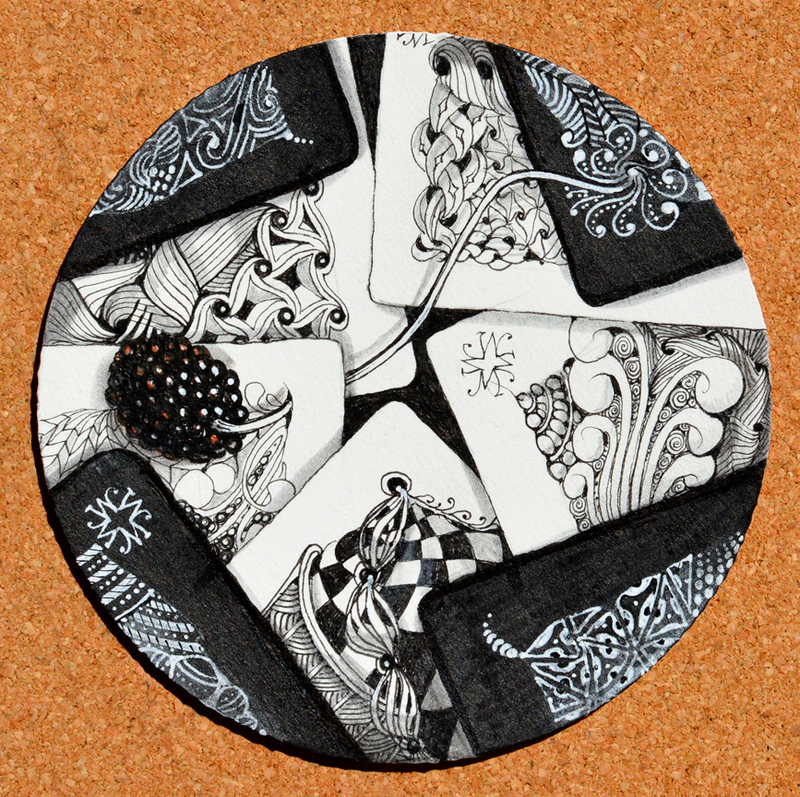 Today I want to talk about our "canvas" of Zentangle art. A square tile is wonderful to tangle. It's so, so . . . even and straight and predictable and, well, square. It is such a great way to start to tangle. No up and down. No worries. Not too big, no overwhelming time frames, and . . . square. But along comes this new gal in town. She's a little more sophisticated. A lot more curvy and voluptuous. Something you could really settle down with, be comfortable with. (Some background music, please.) They call her "Zendala." I like to think of her as another "canvas," not a replacement for our beloved square, but a nice complement to its straight edges and right-angled corners. Maybe we should think of them as a "couple" and leave it at that. The outside measurement of our square 3.5 inch tile is 14 inches. The outside measurement (circumference) of our Zendala tiles is just a bit more than 14.5 inches - not much difference - less than 4% longer. However . . . while the area of a square tile is 12.25 square inches, the area of a Zendala is 16.8 square inches - more than 37% larger! A square tile has more sides than a Zendala, but it only has four symmetrical rotations, while a Zendala with its one "side" (or is that an infinite number of "sides"?) has an infinite number of symmetrical rotations. Square tiles can create a mosaic with no spaces, but a mosaic of Zendalas always has space, even when they are all touching. I'm sure there are some great metaphors to be had in all of that! I love our pre-strung Zendalas, but when I pick up a blank one, I tend to use it like a square . . . with a kind of random string and a bit more white space (usually). On this one . . .
. . . I had some fun with tracing the shapes of square tiles and them tangled them. It was a fun exercise. 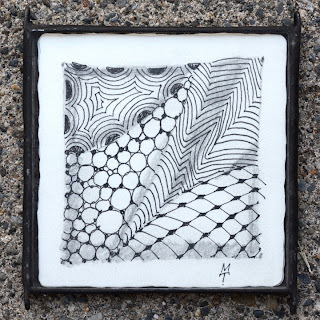 I tangled black on white then colored in the surrounding edge tiles in black and tangled them in white! I also love using the Fabrico gray marker to add another dimension to the black and white. Please feel free to try this, we welcome others using our ideas. 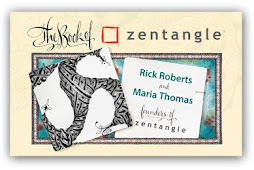 In fact, this sharing of ideas and inspirations is a wonderful characteristic throughout this Zentangle community. So, how do you go about tangling your Zendalas?? Our random picker chose "Kathy" (blog- Penstrokes) to win a tile from us. Congrats. 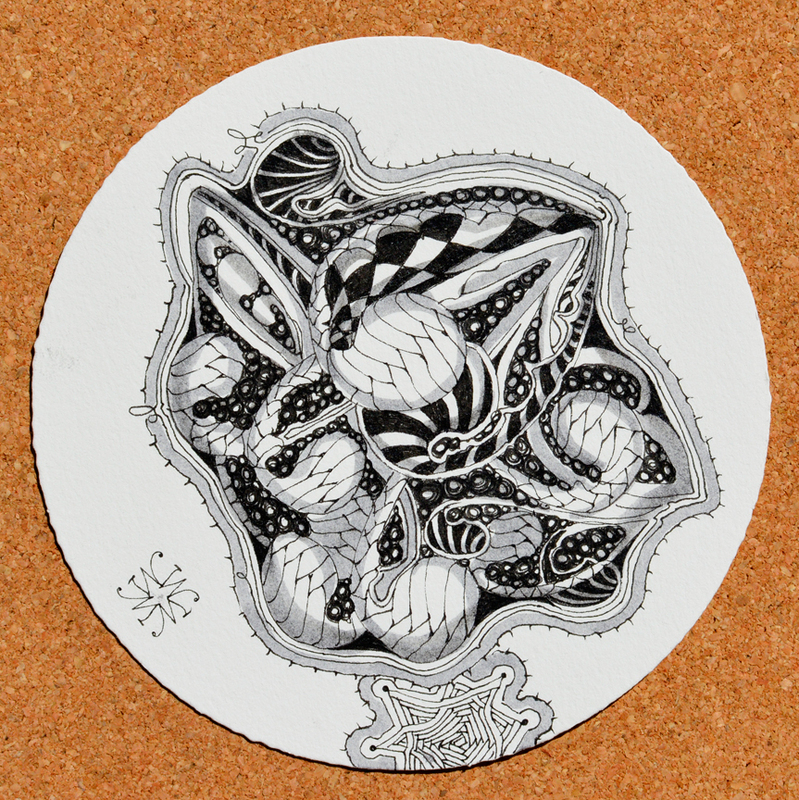 Kathy, please send us your snail mail address to zentangle (at) gmail (dot)com. Click Zendalas to enjoy even larger Zendalas!